1. Introduction. 2. Outline of the strategies for immunoassays. 3. Non-immunological molecular recognition systems used in immunoassays. 4. The nature of immunogens, antigens and haptens. 5. Production of antibodies. 6. The nature and structure of antibodies. 7. Purification of immunoglobulins and preparation of Fab fragments. 8. Kinetics and nature of antibody-antigen interactions. 9. The nature of enzyme activity in immunoassays. 10. 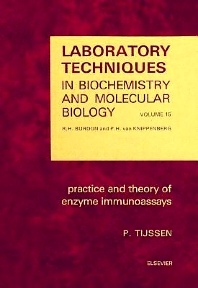 Properties and preparation of enzymes used in enzyme immunoassays. 11. Preparation of enzyme-antibody or other enzyme-macromolecule conjugates. 12. Conjugation of haptens. 13. The immobilization of immunoreactants on solid phases. 14. Quantitative enzyme immunoassay techniques. 15. Processing of data and reporting of results of enzyme immunoassays. 16. Localization and identification of electrophoretically separated antigens after their transfer from gel to membrane. Enzyme immunohistochemistry (EIH) in light and electron microscopy. 18. Potential toxic hazards associated with enzyme immunoassays. References. Indexes. Enzyme immunoassays have developed into a powerful assay technology, transcending several discipline boundaries, extensively applied as a tool in fields other than enzymology and immunology. This volume reflects the rapid progress in the applications of this technique, providing a basic understanding of these techniques and a practical guideline for the choice and experimental detail.